Forecast: Halo Darlin was overmatched in the Sunshine Millions Filly & Mare Turf, but today she drops to a realistic spot and looks capable of regaining her winning form. She’s guaranteed a good ground-saving trip from her rail post and has shown the versatility to win on the lead or from off the pace. “Win rider” Pereira returns. Moonshine Annie, second in her last pair sprinting, stretches out again today and has won at this trip in the past. She’ll be running on late. These are the two we’ll be using in our rolling exotics. Forecast: Reachreachreach just broke her maiden for $20,000 and today is raised to $32,000 in a sign of confidence. The O’Neill-trained filly is a solid fit on speed figures, retains Figueroa, and should settle in the second flight before producing her best bid through the lane. Hot Rod Gal is the 9/5 morning line favorite and strictly the one to beat. She failed to act in a tougher spot down the Hillside course but should snap back at this level with the return to dirt. Pedroza most likely will employ gate-to-wire tactics. With give Reachreachreach a slight edge on top but include both in our rolling exotics. Forecast: ​This starter’s allowance turf miler looks fairly wide open and requires a spread in rolling exotic play. Tough It Out failed to fire in an off-the-turf affair vs. tougher recently but returns to grass today and tackles a field his best can handle. Blanc will give him the patient ride he requires. Kristi’s Copilot isn’t drawn particularly well but he’s intriguing because of the always-dangerous blinkers off angle. Rosario stays aboard for Baltas, and the veteran Lucky Pulpit gelding projects to settle in behind the leaders in a stalking spot. He’s always been most comfortable as a front-runner, but we suspect they’ll try to rate him today. Tigerbeach is racing in sharp form for Morey and stretches out again after finishing second as the favorite in a recent downhill dash. He’ll be dangerous if he can make the lead without undue pressure, but there are other committed front runners in the race so he may have to improvise. Forecast: Bold Trump was nosed out in a tough starter’s allowance sprint last month while earning a career top speed figure. A similar effort today should be good enough to beat this restricted (nw-3) $35,000 claiming field. From his outside draw he can settle into an ideal pace-stalking trip. Treasure Hunter moves up in claiming value after just missing in a $25,000 open seller in a race restricted to 4-year-olds. He should get at least a share but will need to step it up in the speed figure department to win. We’ll include him on a ticket or two in our rolling exotics but the main punch goes to Bold Trump. Forecast: Bellafina is listed at 2/5 on the morning line and looks it on paper. 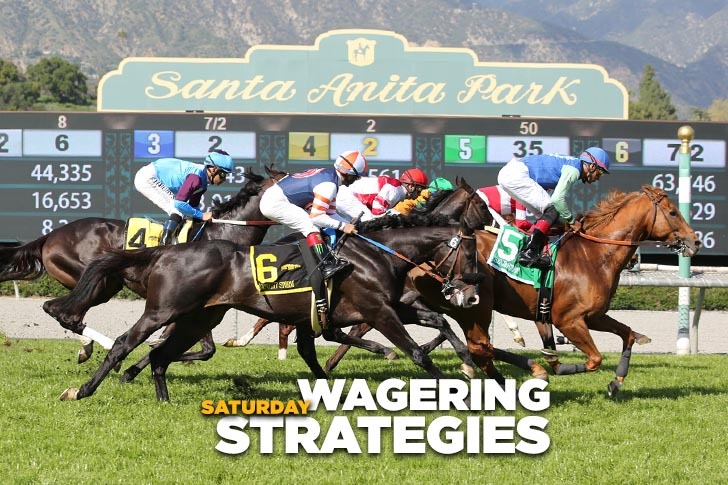 Her 8 ½ length romp in the Santa Ynez Stakes last month might have been her best race ever, and she’s proven she can be just as effective two-turning, as evidenced by her dominating win in the Chandelier Stakes during the fall meeting. She’s a no-value, free bingo space in rolling exotic play. Forecast: ​We Will Re Joyce had speed before fading in a first-level allowance state-bred sprint less than a month ago and today shows up in an $8,000 claimer. A winner of nine of 26 career starts, she’s a real pro when properly spotted and against this group she should have little difficultly, assuming she at least one good one left. Cioppino Pasadino, up a notch after a facile score for $62,500, will be the one to fear most for new trainer Nunez. She’s won six of 14 over the Santa Anita main track, retains Delgadillo, and can be expected to produce her usual solid race. Forecast: Ohio shipped to Phoenix to win the listed Cotton Fitzsimmons Stakes last month by more than six lengths and the margin could have been double that. This obviously is a tougher spot but in his present form the veteran Brazilian-bred could easily be up the task. Of course, River Boyne will be a short price favorited; the Irish-bred colt is a perfect six-for-six over the local lawn but will be facing older foes for the first. Both should be included in rolling exotic play; Ohio will be the better price, for sure, so we’ll press with extra tickets keying him on top. Forecast: Mr Paytience ran like a short horse in his comeback last month. The 3-year-old son of Paynter pressed the pace inside throughout under heavy pressure before weakening late in a pretty good first-level allowance race and should move forward considerably today. He has that blinkers off angle that we like while retaining Bejarano. Much Better is the likely choice and one to beat for Baffert. His only prior sprint was his maiden debut score, and after three two-turn attempts in stakes company he drops into allowance company while turning back in trip. He’s also adding blinkers. Both should be included in rolling exotic play; based on price we’ll give Mr Paytience the nod on top. Forecast: Beach View is tough on any surface but probably is a tad most effective on grass. A respectable fourth in the San Antonio Stakes in December behind Gift Box and Battle of Midway, the son of Giant’s Causeway gets an extra furlong to work with today and looks capable of producing the last run. Dabster is more than good enough to win this race if he can transfer his main track form to turf. This will be his first grass try, so who knows? He doesn’t really have a turf pedigree. Sejo is an intriguing European invader in the Sadler barn, and while his form in France was good but not at this level, he gets Prat and Lasix so at 12-1 on the morning line he’s worth including on a ticket or two, at least. Forecast: This is a messy restricted (nw-3) abbreviated sprint for $16,000 claimers in which no result would surprise us. Honeymoonz Over is re-equipped with blinkers, retains Prat, and drops two notches while still remaining above his claim level. A repeat of his race before last buries this group, but that was over a wet-fast track so the race really can’t be trusted. Tanners Pride ran well at about this level two runs back at Del Mar but was out of his element when raised to a first-level allowance sprint here last month. If he can negotiate a decent trip from the rail, the Koriner-trained gelding can be a strong factor. Crazy Uncle Rick drops to his lowest level ever, has a prior win over this main track and room for improvement, having run just six times. He switches to bug boy Figueroa, so at 10-1 on the morning line he’s worth tossing in. Forecast: Scarlet Heat was well-meant in her debut but came up a tad short when settling for third in a similar state-bred maiden special weight race over this course and distance. She’s likely to improve considerably, and if she does she should earn her diploma. Rosario stays aboard for Blacker. Dr Wysong, a closing third in her debut in December at Del Mar, is another that should produce a forward move with that bit of experience behind her. She’s also adding blinkers today and retains Prat. On pure numbers, she’s the one to beat but is bred much more for dirt than turf. We’ll try to get by using just these two in our rolling exotics with preference on top to Scarlet Heat.